Competitive social interactions are ubiquitous in nature, but their genetic basis is difficult to determine. Much can be learned from single gene knockouts in a eukaryote microbe. The mutants can be competed with the parent to discern the social impact of that specific gene. Dictyostelium discoideum is a social amoeba that exhibits cooperative behavior in the construction of a multicellular fruiting body. It is a good model organism to study the genetic basis of cooperation since it has a sequenced genome and it is amenable to genetic manipulation. When two strains of D. discoideum are mixed, a cheater strain can exploit its social partner by differentiating more spore than its fair share relative to stalk cells. Cheater strains can be generated in the lab or found in the wild and genetic analyses have shown that cheating behavior can be achieved through many pathways. We have characterized the knockout mutant chtB, which was isolated from a screen for cheater mutants that were also able to form normal fruiting bodies on their own. When mixed in equal proportions with parental strain cells, chtB mutants contributed almost 60% of the total number of spores. To do so, chtB cells inhibit wild type cells from becoming spores, as indicated by counts and by the wild type cells’ reduced expression of the prespore gene, cotB. We found no obvious fitness costs (morphology, doubling time in liquid medium, spore production, and germination efficiency) associated with the cheating ability of the chtB knockout. In this study we describe a new gene in D. discoideum, chtB, which when knocked out inhibits the parental strain from producing spores. Moreover, under lab conditions, we did not detect any fitness costs associated with this behavior. Microorganisms are able to communicate and cooperate to perform complex social behaviors once believed to be distinctive of multicellular organisms [1–5]. This includes formation of biofilms, foraging, spore dispersal and production of common goods. Cooperative groups are vulnerable to exploitation by cheaters, individuals that benefit from the product of cooperation without contributing their fair share [5–9]. In Pseudomonas aeruginosa and Myxococcus xanthus[11, 12], for example, the release of siderophores and digestive enzymes, respectively, represent costly activities that could be exploited by non-producers. In both organisms, strains grown in liquid culture for a number of generations sometime evolve to lose the ability to cooperate and instead behave as cheaters. Dictyostelium discoideum displays cooperative behavior that provides a great model for the study of cheating. D. discoideum propagates as free-living unicellular amoebae feeding on bacteria associated with leaf litter, soil, and animal dung. In the past few decades, this social amoeba has been intensively studied because of its extraordinary development , which is a form of cooperation. When starving, cells aggregate and eventually form a multicellular organism capable of movement towards light and heat and away from chemicals such as ammonia [14, 15]. Under the correct conditions, they develop into a fruiting body that represents the final stage of development . About 20% of the cells differentiate into dead stalk cells that support the other 80%, which differentiate into viable spores. When spores are dispersed to a new source of food, they germinate to become amoebae and restart the vegetative stage of eating and dividing by binary fission. Stalk cells have been described as altruistic, since their death is presumed to aid the dispersal of the spores that form the next generation . If the population consists of cells that are genetically identical, or related, it is possible to compare these individuals to somatic cells in a multicellular organism, or to a social insect colony. But when cells are genetically different, a conflict may arise over which cells survive and which form the stalk and die. In this case, a strain that differentiates more than its proportional share of spores is called a cheater and the other is called a loser. In several cases, reproductive competition among cells within a chimera has been reported, but the cheater strains often carry a fitness cost relative to non-cheaters even to the extent that they are incapable of sporulating efficiently on their own [18–20]. On the other hand, in D. discoideum several strains isolated from the wild are capable of cheating and of producing fruiting bodies independent of other clones . A large number of knockout or reduced function mutations generated in the laboratory also show such facultative cheating behavior . These mutants are capable of producing spores in pure populations, but preferentially become spores and not stalk cells when mixed with the ancestral strain. In D. discoideum, many genes have been reported to be involved in the disruption of cooperation, but not much is known about the underlying genetic mechanisms. The analyses performed so far on cheater mutants showed that multiple mechanisms and pathways may be involved in cheating behavior, with cheater mutants showing diverse functions including GTPase regulatory activity, polyketide synthesis, nucleotide binding, and phosphoric ester hydrolase activity . Some of these pathways are involved in cell-cell communication, formation of secondary metabolites, or signal transduction. They can affect the communication pathway that regulates the proportion of spores and stalk cells , or disrupt the ubiquitin-ligase pathway responsible for the breakdown of certain target proteins . Other mechanisms that can lead to cheating  might be the expression of spore genes earlier than prestalk genes ; premature entrance into development; presence of multinucleated cells that lead to more cell divisions during development; cannibalism, as is present in Dictyostelium caveatum; and production of a killer factor as reported in Polysphondylium pallidum. Cheater strains in the Dictyostelidae typically have a fitness cost or some deleterious pleiotropic effect that prevents the mutant from spreading, since otherwise a loss of function mutant would easily evolve. This is the case of mutants chtA, dimA, and csaA[19, 27, 28]. In this work we characterize a mutant called chtB that can facultatively cheat when mixed with the parental strain, but does not suffer from an obvious fitness cost in the laboratory. When mixed with chtB, the parental strain produces fewer spores and expresses a lower level of the pre-spore gene cotB. A mutant called chtB (cheater B) was recovered at the end of a selection for mutants that preferentially produce spores rather than stalks in a mixed population . In the parental strain AX4, the chtB transcript appears early in development and is completely absent in chtB mutant cells. This mutant produces a higher number of spores than AX4 in chimeras that are made with equal numbers of cells of the two strains. When it is plated clonally it shows a normal developmental phenotype, so it is not dependent on parental cells in a social stage chimera. The loss of function of the chtB gene also increases expression of cotB, a prespore marker, early in development, indicating the mechanism of action is early specialization as spore over the ancestral strain. On the other hand, parental cells reduce the expression of cotB and differentiate a lower number of spores in chimera. We tested chtB mutants to detect whether fitness costs were associated with its cheating ability. Not only did we not detect any fitness cost, but we also found that the mutant presents the same sporulation efficiency and faster doubling time when grown in liquid, than AX4. Finally, the presence of chtB mutant cells in chimera with parental strain limits the expression of a pre-spore marker in the latter. As a consequence the parental strain is unable to produce its fair share of spores. We isolated the chtB mutant during a selection for cheaters from a pool of 10,000 mutants . This pool of mutants was subjected to 20 rounds of growth, development, and spore germination in a mixed population so that cheaters that differentiate into spores with a higher efficiency would become enriched in the evolving population. At the end of the selection, chtB was one of the mutants that were randomly chosen to be tested for cheating properties. To confirm that chtB really increased its frequency during the selection, we used quantitative PCR (Q-PCR) to obtain information about the abundance of the chtB allele. We extracted genomic DNA from the entire population after the 1st, 10th, and 20th generations of the selection and used gene-specific primers to quantify the chtB allele. The mutant chtB increased 7.4 fold at the 10th generation and 26.4 fold at the 20th (Figure 1), thus supporting the hypothesis that this cheater increased in frequency during the selection. The chtB mutant increases in frequency during the selection. 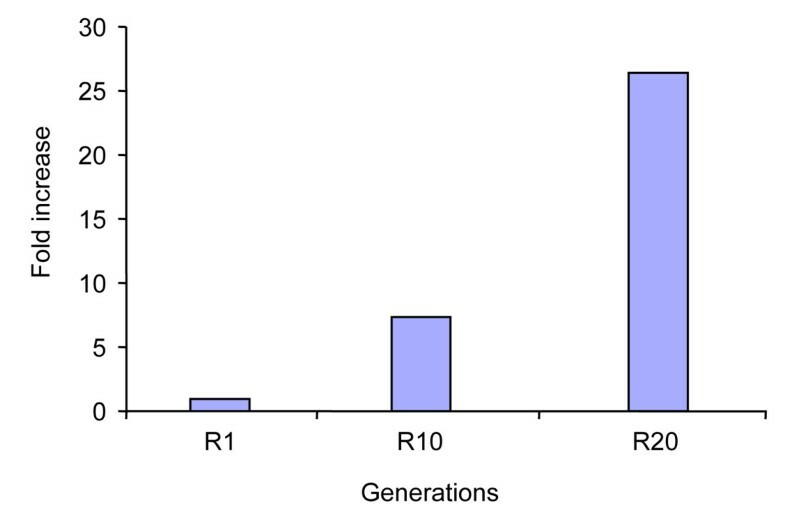 Q-PCR using DNA from the entire population at the 1st, 10th and 20th generation (R1, R10 and R20) and using primers specific to the chtB allele, shows that the mutant chtB increased 26.4 fold by the end of the selection. The mutant chtB was generated by insertional mutation of the pBSR1 plasmid  in chromosome 5 at position 4377789 towards the 3’ end of the ORF of the gene DDB_G0290617 (Figure 2). The predicted protein has not been studied before and it consists of a FNIP repeat (named FNIP after the pattern of a conserved motif found only in D. discoideum). We named the gene chtB because its social behavior resembles the previously described chtA mutant . To verify that the insertion was responsible for the mutant phenotype, the mutation was recapitulated by homologous recombination in the AX4 genetic background using the rescued plasmid as a knockout vector . We confirmed the mutation by Southern blot hybridization using a gene-specific probe and tested the strain for cheating. The chtB gene is located on the chromosome 5. The gene contains one short intron (thin black line) and two exons (thick red lines) as indicated in the gene model. The red triangle indicates the position of the insertional mutation generated by REMI. RT-PCR analysis showed that the parental strain AX4 expressed the chtB mRNA at 0 hours of development and mRNA abundance was greatly increased at 4–24 hours (Figure 3). In the mutant cells, chtB mRNA was not expressed at any time. The chtB gene is expressed during development and is completely silent in our mutant. RT-PCR reaction using RNA extracted during a time course (time points indicated in hours) shows that the chtB mRNA is observed only in AX4 during development. No mRNA is detected in the mutant chtB. To be defined as a cheater, the mutant chtB must produce significantly more than 50% of the spores in a pairwise mixing experiment with the parental strain, and this was the case. When mixed at equal proportions with AX4, chtB differentiated 59.9±3.3% of the total number of spores. This result differed significantly from the control chimera between AX4 and AX4 [act15/GFP] (p<.0001, T-test; Figure 4). The chtB mutant cheats on AX4. When mixed with the parental strain AX4 [act15/GFP], chtB differentiates 59.9±3.3% (n=22) of the total spores. Control AX4 cells mixed with AX4 [act15/GFP] cells differentiate 50.1±1.0% (n=27) of the total number of spores. The chtB strain differentiates a significantly higher number of spores than the parental strain (Two tailed t-test, p<.0001. Bars represent standard errors). To test whether chtB shows any morphological difference relative to its ancestor, we observed cells of both strains at different stages of development. In both parent and knockout, we observed loose aggregates at about 10 hours, tight aggregates at 12 hours, fingers at 16 hours and Mexican hats at 20 hours. Between 20 and 24 hours both strains culminated, leading to the formation of well-proportioned fruiting bodies consisting of stalks cells and spores (Figure 5). We saw no noticeable differences between the phenotypes of AX4 and chtB developed on filters. Developmental morphologies of AX4 and chtB . We grew the cells in axenic medium and developed them separately, as indicated, on nitrocellulose filters. We photographed the cells from above at the indicated times (bar = 1mm). A fitness cost for a cheater could be manifested as reduced sporulation when developing in a pure population. To test that possibility we developed chtB cells in a pure population or mixed with AX4 cells. The results (see Additional file 1: Figure S1) show that the sporulation efficiency of chtB (83.11±4.69%, n=10) is not significantly different from AX4 (71.53±5.82%, n=10, t-test p<0.14), suggesting that the mutation does not have a sporulation-related fitness cost. The chimera sporulation efficiency was similar to both pure populations (84.16±7.26%, n=10, t-test p=0.19 vs. AX4, p=0.90 vs. chtB). We also tested whether a fitness cost may be associated with the spore germination efficiency. Our results show that chtB was able to germinate a number of spores (72.3±16.2%) comparable to AX4 (75.5±15.1%, t-test, p=0.08, n=6). This result indicates that chtB does not produce fewer viable spores than its parent (Additional file 2: Figure S2). To compare the growth rates of the chtB mutant and its ancestor, we grew cultures of chtB and AX4 in liquid media starting at a cell density of 1x105 cells/ml. chtB reached log phase after about 40 hours, while AX4 took about 10 hours longer. 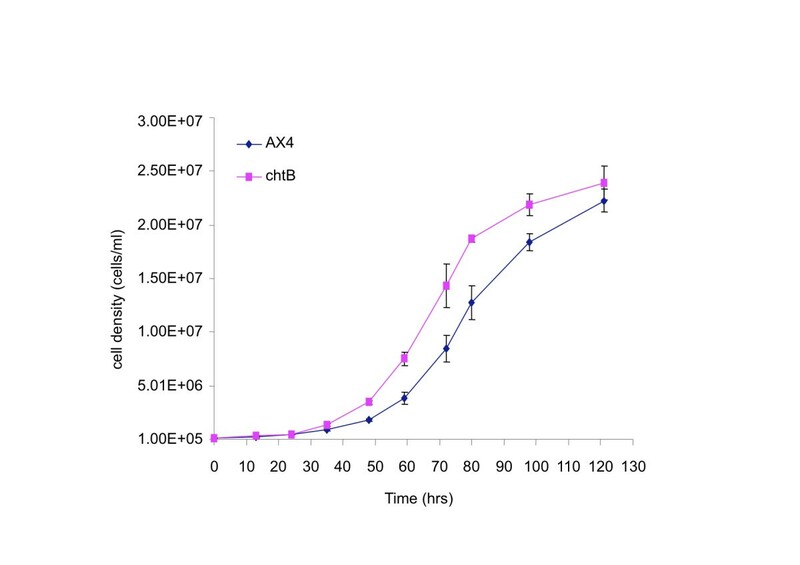 When in logarithmic phase, chtB cells showed a doubling time of 7.6±0.7 hours (Figure 6) while AX4 cells showed a doubling time of 10.3±1.5 hours (t-test, p<0.05, n=3), showing that chtB has a faster doubling time than AX4 in liquid medium. Growth curves of AX4 and chtB cells in liquid HL5 medium. Cell densities of the two strains, as indicated, are plotted as a function of time (hrs). We assessed cell-type proportioning by measuring beta-galactosidase activity in cells that express the marker under the promoters of either cotB (a prespore marker) or ecmA (a prestalk marker). We measured the overall enzyme activity in the population using an ONPG-assay and the number of cells of each type using X-gal staining as described . 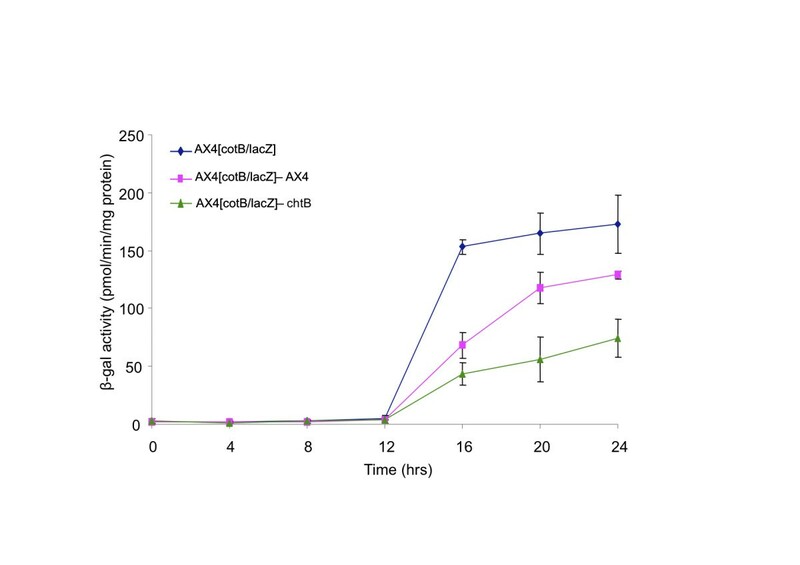 We compared the level of lacZ expression in chimerae between the reporter strains and AX4 or chtB to determine the effect of chtB on prespore and prestalk differentiation in the AX4 victim. ONPG analysis of AX4 [cotB/lacZ] showed that cotB is not expressed until 12 hours. Then it starts increasing and reaches saturation at 16 hours (Figure 7). If AX4 [cotB/lacZ] cells were mixed at a 1:1 ratio with AX4 cells that do not express lacZ, the level of β-galactosidase activity is about half of that produced by AX4 [cotB/lacZ] alone. When AX4 [cotB/lacZ] cells were mixed at the same ratio with chtB cells, the β-galactosidase activity was significantly lower than in the mix with AX4 (16, 20 and 24 hour time points, t-test, p<0.05, n=3). 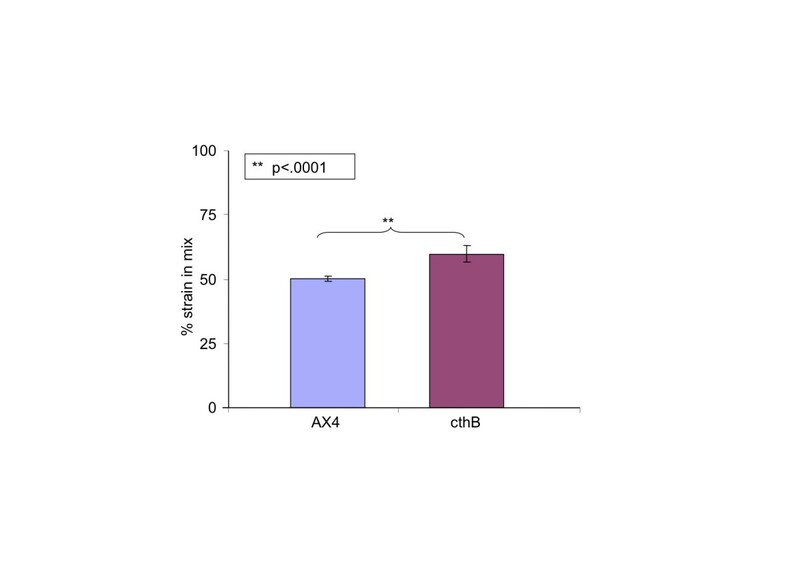 These results show that in chimeras chtB is able to reduce the expression of cotB in the wild type cells and that AX4 cells are forced to form fewer prespore-cells than their fair share. ONPG analysis of AX4 cells expressing the lacZ gene under the prespore promoter cotB . Cells were developed alone or mixed at a 1:1 ratio with AX4 and chtB cells. Developmental time points (hours) are represented on the x-axis and beta-galactosidase activity on the y-axis. When AX4 [cotB/lacZ] are mixed with chtB cells, the β-galactosidase activity is lower than when mixed with AX4 (16, 20 and 24 hour time points, t-test, p<0.05, n=3). To test whether the presence of chtB cells in chimeras affects prestalk cell formation in the victim, we performed a similar analysis using the strain AX4[ecmA/lacZ] alone and in pairwise mixes with AX4 and chtB (Figure 8). In this case, no significant differences were seen in the β-galactosidase activity when AX4[ecmA/lacZ] cells are mixed with AX4 or with chtB. We conclude that the presence of chtB cells in chimeras does not influence the expression of the prestalk marker ecmA in the wild type cells. ONPG analysis of AX4 cells expressing the lacZ gene under the prestalk promoter ecmA. Cells were developed alone or mixed at a 1:1 ratio with AX4 and chtB cells. Developmental time points (hours) are represented on the x-axis and beta-galactosidase activity on the y-axis. β-galactosidase activity did no differ when AX4[ecmA/lacZ] cells are mixed with AX4 or with chtB. 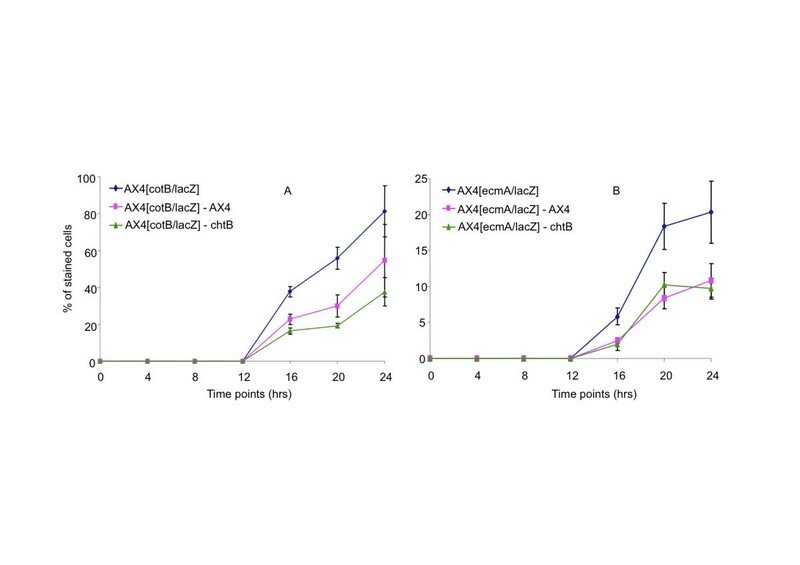 The results obtained with ONPG analysis show that the presence of chtB cells in a mix with AX4 reduces the promoter activity of the pre-spore gene cotB. This observation could be due to reduced cotB expression in all the wild type prespore cells, or to a reduction in the number of prespore cells in the wild type. We addressed this issue by counting the number of cells that expressed the marker gene. When AX4 [cotB/lacZ] were mixed in equal proportions with chtB (Figure 9A) they produced a significantly lower percentage of stained cells than when mixed with AX4 (for 16 and 20 hour time points, t-test, p<0.05, n=3). Therefore we conclude that, in chimera with wild type, chtB forces the parental cells to reduce the proportion of prespore cells and, as a consequence, to produce fewer spores. 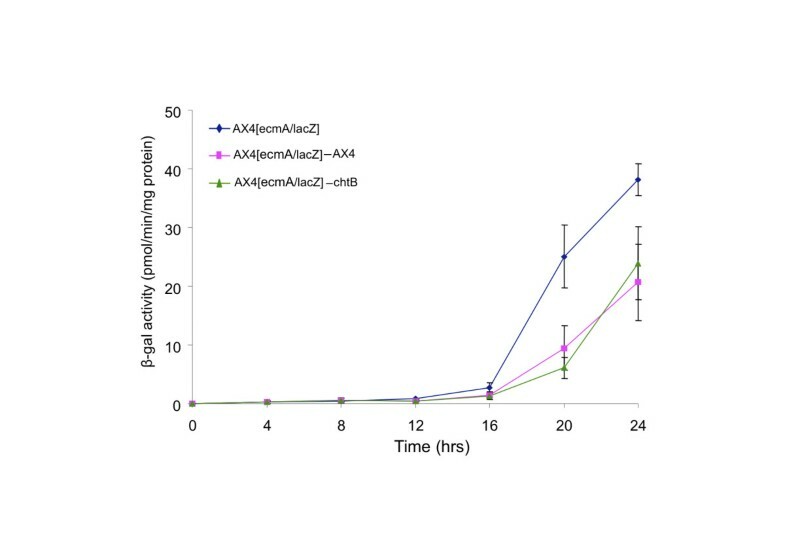 When the same test was performed using the AX4 [ecmA/lacZ] strain (Figure 9B), there was no difference between the number of stained cells observed in mixes of AX4[ecmA/lacZ] with AX4 or chtB (for 16, 20 and 24 hours time points, t-test, p>0.26, n=3). We conclude that the presence of chtB in chimera did not affect the number of prestalk A cells produced by the victim strain, but could have made them become prestalk B (pstB) cells, which normally produces the basal disc of the fruiting body, or pstO cells, which occupy the rear half of the prestalk region. Changes in the proportion of prespore cells but not in prestalk cells. (A) Cells expressing lacZ under the cotB promoter or (B) under the ecmA promoter were developed alone or mixed with AX4 or chtB in a 1:1 ratio. Developmental time points (hours) are represented on the x-axis and percentage of stained cells on the y-axis. AX4[cotB/lacZ] mixed with chtB at the 16 and 20 hours time point, shows a significantly lower percentage of stained cells than when mixed with AX4 (for the 16 and 20 hours time points, t-test, p<0.05, n=3). AX4[ecmA/lacZ] mixed with chtB does not show a significant difference in the percentage of stained cells than when mixed with AX4. (For 16, 20 and 24 hour time points, t-test, p>0.26, n=3). We isolated and characterized a mutant called chtB that cheats without overt fitness costs. chtB was isolated after a genetic selection for cheaters that were able to form fruiting bodies clonally . The mechanism by which chtB cheats in chimeras is novel. chtB reduced the expression of the prespore marker cotB in the wild type population as a consequence of the wild type strain forming fewer prespore cells than it does in control mixtures. One might expect then that these missing wild type prespore cells end up making stalk, but we found no evidence for this; chtB does not alter the wild type expression of the prestalk marker ecmA. It is therefore unclear what happens to the wild type cells that would have produced spores. To test whether the chtB mutation was associated with fitness costs, we tested the strain’s growth, developmental morphology, sporulation and germination efficiency and found no adverse effects compared to the ancestor AX4. Indeed there was some evidence of better performance by the mutant. The chtB mutant grows faster than the wild type in liquid medium. This finding cannot account for the increase in frequency of chtB during the original selection, because the selection was performed on agar plates, where chtB does not have a growth advantage . The behavior of the mutant raises both mechanistic and evolutionary questions. On the mechanistic side, we begin by asking whether its higher representation in spores is due to either fixed or facultative allocation strategies . In the fixed allocation strategy, the cheater produces more spores than the loser when each are grown as pure clones. In this case, the cheater has not changed its behavior in chimera; its solitary strategy carried over to the chimeric setting gives it an advantage. In the facultative allocation strategy, the cheater produces more spores in chimeras than expected from its solitary production. The spore production of chtB is not significantly higher than that of AX4, suggesting it is a facultative cheater. However the point estimate is higher, so it is worth considering whether, if that non-significant difference were real, it could explain cheating as a fixed strategy. In fact it cannot, as the 59.9% representation observed in chimeras is significantly more than the expected fixed allocation of 54.0% (calculated from chtB on its own divided by the sum of chtB on its own and wildtype on its own, or 83.1/(71.5 + 83.1)). Thus chtB appears to be a facultative cheater, indicating that an additional cheating mechanism is at play besides fixed higher spore production. Several wild clones of Dictyostelium discoideum and many laboratory mutants [21, 22] are also cheaters that do not exhibit overt phenotypic abnormalities, but the previous studies did not explore possible costs that might be associated with the cheating behavior. Cheater strains in a population can be viewed as parasites since they use common resources without paying the cost, which could lead to the collapse of the entire social machinery. Several mechanisms have been suggested to explain why cheaters do not take over the entire population . High relatedness is an important control of cheaters, because it means that like groups with like, so cheaters have reduced opportunity to exploit cooperators [36, 37]. This explanation does not seem to apply to chtB because it does at least as well as wild type even when alone, so it would appear to be favored even at high relatedness, with an added boost from cheating in any chimeric mixtures. With or without high relatedness, disadvantageous pleiotropic effects can also keep a mutant from spreading . We detected no pleiotropic disadvantages of chtB. However, there are two important caveats. First, all the cheating experiments reported so far were performed in the laboratory under controlled environments. In the wild, however, factors like temperature, pH, and moisture could influence both cheating efficiency and pleiotropic effects. The chtB knockout behaves as a cheater under the conditions that we have used, but it may not be able to cheat in nature. Likewise, inactivation of chtB had no apparent adverse consequences in the laboratory, but it must have a cost that would limit its propagation in nature, or the gene would have been lost. Second, selective forces too small to effectively be detected in the laboratory could still be important in nature. One hypothesis that combines these two caveats is that chtB might suffer from reduced dispersal from shorter stalks. If chtB produces more spores, it may produce shorter stalks. We did not attempt stalk measurements because they are far less accurate and more variable than spore measurements. Shorter stalks might reduce dispersal, presumably by animal vectors. Another possibility is that the mechanism by which chtB knockouts achieve their success in chimera involves earlier fruiting. If this is the case, it could be that this is normally a disadvantage, keeping the mutant from spreading. In this study we describe a novel mechanism by which a D. discoideum cheater exploits parental strain cells by inhibiting them from producing spores. One way to understand how cooperative behaviours have evolved and are maintained is to identify the mechanisms cheaters use to exploit such cooperation. Moreover, for the first time we concluded that under our experimental conditions there are no fitness costs associated with the cheater trait investigated, unlike the disadvantageous pleiotropic effects that are suggested mechanisms preventing cheaters from spreading in a population. The Dictyostelium discoideum strains used were the axenic strain AX4 , AX4 [actin15/GFP], and the REMI mutant chtB. Cells were grown in suspension in HL-5 medium or on SM agar plates in association with Klebsiella aerogenes. HL-5 was supplemented with the antibiotics G418 or Blasticidin S (both at 5μg/ml), as required. Quantitative PCR was performed using the DNA Opticon® Engine system BIO-RAD . As template for the reaction we used genomic DNA extracted from the 1st, 10th and 20th round of selection. Specific chtB primers were used to obtain amplification. IG7 (a constitutively expressed gene) was used as the loading control. SYBR Green was used as the dsDNA fluorescent dye. AX4 and chtB cells were plated on two black filters each (5x107 cells/filter) and the entire populations were collected at different developmental time points. We extracted RNA using the TRIzol reagent (Invitrogen) according to the manufacturer’s recommended procedures and dissolved it in 100 μl of 1X MOPS buffer . Total RNA was reverse transcribed using SuperScript™ II Reverse Transcriptase kit (Invitrogen) and oligo d(T) primers. Q-PCR was performed on the resulting cDNA using chtB gene-specific primers. The products were resolved by electrophoresis on a 0.8% agarose gel, stained with ethidium bromide, and observed under UV light. The strain chtB was tested for cheating behavior in pairwise mixing experiments using the GFP-labeled strain method as described . Wild type and mutant cells were grown in HL5 liquid medium. Once in log phase (between 1×106 and 5×106 cells/ml), cells were washed twice with KK2 buffer (16.3mM K2HPO4, 3.7mM KH2PO4, pH 6.2) and resuspended in PDF (20mM KCl, 5mM MgCl2, 9mM K2HPO4, 13mM KH2PO4, 0.3mM streptomycin sulfate, pH 6.4) at a density of 5×107 cells/ml. 1 ml of this cell suspension was deposited on Black nitrocellulose filters  and incubated at 22°C. Pictures were taken every two hours. We plated 5x107 cells on a KK2 agar plate both clonally and in 1:1 ratio. After 30 hours the entire contents of the plates were collected and resuspended in 1 ml of KK2 with 0.1% NP40 so that only spores could survive. To assess spore number, a measured aliquot from each sample was counted with a haematocytometer. The sporulation efficiency was calculated by dividing the number of spores collected at the end of development by the total number of cells plated initially. Spores were counted and plated out at low density (100–500 per plate) on SM plates with 300 μl of Klebsiella aerogenes. After a few days, single plaques were observed in the bacterial lawn, each representing a viable spore. The proportion between the number of plaques observed and the number of the spores plated indicated the germination efficiency. Cells were inoculated at a density of 1×105 cells/ml in 250ml Pyrex flasks containing 50 ml of HL5. The flasks were shaken at 200 rpm at 22°C until the cultures reached stationary phase at a density of about 2.5 × 107cells/ml. Samples were collected at 12 hour intervals and the cells were counted. Each experiment was repeated three times. The strains used for this analysis were TL1 (AX4 [cotB/lacZ]), TL6 (AX4 [ecmA/lacZ]), the chtB mutant and the parental strain AX4. Strains expressing the lacZ gene were grown in the presence of 5μg/ml G418. Cells were grown in HL5 liquid medium and then plated on black filters as described previously. Each lacZ strain was plated alone or mixed in 1:1 ratio with AX4 and chtB. AX4 [cotB/lacZ] cells were plated in a pure population or mixed at a 1:1 ratio with AX4 and chtB on white nitrocellulose filters. Cells were collected from filters at different time points, resuspended in Pronase buffer (0.1% Pronase, 14mM β-mercaptoethanol, 150mM NaCl, 50mM Tris, pH 7.0) and dissociated by trituration. The cells were fixed stained with X-gal as described  and counted under a microscope. For each data point we counted between 150 to 300 cells and determine the percentage of stained cells over the total number. We thank the members of the Kuspa, Queller, Shaulsky and Strassmann labs for friendly support and much advice during the project. This material is partly based upon work supported by the National Science Foundation under Grant Nos. EF0626963, and DEB0918931. Conceived and designed the experiment and advised on experimental procedure, analysis and writing: LAS, AK, GS, DCQ and JES. Performed the experiments LAS; analyzed the data and wrote the paper: LAS, AK, GS, DCQ, and JES. All authors read and approved the final manuscript.